Everyone loves s’mores. They are a delicious and easy treat and that special combination of marshmallows and chocolate just has to be good! But…What about in the summer? S’mores are good, but eating hot food in hot weather isn’t the best. So how about… S’mores Pops! Step 1: Take the mini-marshmallows and chop them in half. You will need four halves for each S’mores Pop. Step 2: Get out the graham crackers, and break them into the size of pop that you want. Step 3: Line a container or containers with wax paper. Make sure your container is big enough for the S’mores Pops you want to make. Step 4: Break apart both Hershey bars, and put them in a bowl with the ⅛ stick of butter. Heat in microwave for 30-40 seconds. Stir until gooey. Step 5: Dip each graham crackers halfway into the chocolate. 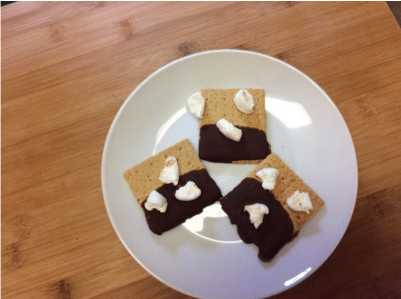 Put the four marshmallow halves on one side of the chocolate covered cracker. Step 6: Set the completed S’mores Pop in wax paper lined container. Repeat this process until you have used all of your graham crackers and marshmallow halves. Step 7: Refrigerate for 1 hour, and enjoy! S’mores Pops don’t normally give you brain freeze, because they melt pretty quickly in your mouth. For a bonus, you can substitute marshmallow halves for peppermint-stick pieces.